If prints on Canon equipment, are coming out with lines, it is best to clean the rollers where the head moves. Canon printers are considered the best for ease these have to install continuous ink system. 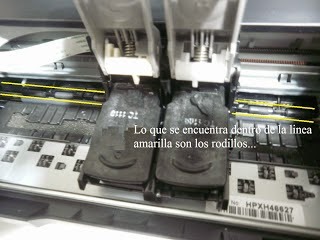 If the systems are not proper installation can make ink spills inside the printer, even when we fill the ink cartridges is possible that these spilled ink. Canon printers, specifically printers inkjet, the carriage of these printers with cartridge goes through what is called the printer rollers. To clean this roller Canon printers are recommended before all do the procedure we can get in our control panel printer maintenance. Always remember, if you have any comments or assistance to this publication, write a review, are always answered quickly. Another reason I typically leave behind stained pages causes the printer roller having rubber this serves to pull the pages and start the printing process, is recommended to clean this with a little damp cotton or cloth.